UES is the leading used oil collector and processing company in the southeastern United States. Covering 14 states, UES collects more than 40 million gallons of used motor oil as well as used industrial oil annually. We offer comprehensive service coverage in these key states: Alabama, Arkansas, Florida, Georgia, Indiana, Kentucky, Mississippi, North Carolina, South Carolina, Louisiana, Tennessee, and Virginia. We also service locations in Ohio and Illinois. 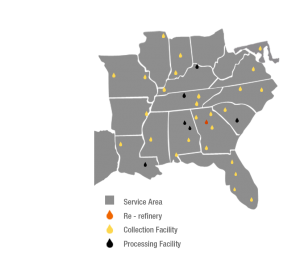 In addition, our refinery in Peachtree City, GA., is one of the most productive in the whole country.